The name of the game in Northeast Ohio is endless. This is an exciting time in our cities, which provide family-friendly sports teams that rival even the biggest regions when it comes to the players, the coaches, the fans, the foods — and most importantly, the mascots. They’re the ones who get a smile from the littlest of fans to the oldest. Our region is home to some wonderful characters who have the best team spirit and never fail to energize the crowds. 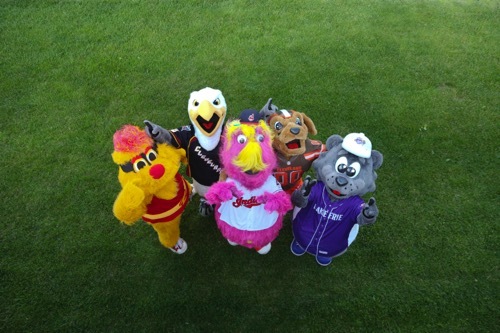 We found out a little more about each of these lovable mascots. Hobbies or Interests: Hanging out with best friends Sir CC and Moondog, and supporting local Cleveland and Northeast Ohio sports teams. Ohio: A stroll through Monument Park in Canton with a stop at the Pro Football Hall of Fame. Position and or Number: Plays all! How I got my name: Dad’s favorite pitch! Hobbies or Interests: Playing drums for Slider & The Dogs band, baseball, dancing, music, eating popcorn and cheering on the Tribe!! Favorite music: Anything with drums! How I got my name: What the boys do when I win the Hot Dog Derby: CRY! Favorite movie: “A League of Their Own” because there is no crying in baseball, even for Onions! How I got my name: What I always have to do in the Sugardale Hot Dog Derby: KETCHUP!